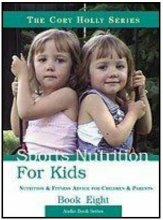 Sports Nutrition For Kids is the eighth in a series of audio books narrated by Tracy Holly CSNA Master. It is devoted to the world's most important natural resource...our children. As health minded parents we are obligated by the law of love to protect, nourish and sustain our children to the very best of our ability. This book covers lifestyle, exercise, physical activity, supplements and basic nutrition principles for children to help them stay lean, healthy, strong, independent and well for life. "Thanks to the advice of Cory and Tracy and their philosophy on nutrition, my twins enjoy a healthy and relatively pain free existence. As you will discover, these ideas are simple and very practical, and if put into practice you too can enjoy the same success that we currently enjoy as loving parents."